The instructions on how to make the Halloween Creepy Spider card are in my previous posting. Here I will show you how to make the web for this card. See further bellow. 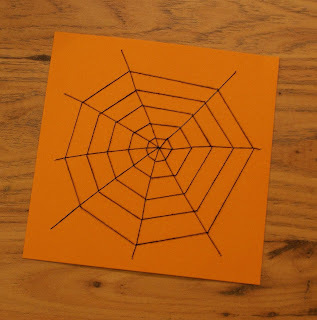 I took pictures at various stages of making the spider web for my Halloween Creepy Spider card. This should make it easier. Take an orange card paper (15 x 15 cm). With a black pencil, draw dots on the card. Draw one dot more less in the middle and then about 8 dots closer to the edges of the card as you can see in the picture above. This will give you the starting points to draw your spider web. Take a ruler and draw 8 lines, connecting the dots on the edge of the card to the centre dot. Then choose the shortest line and use it as a starting point for the next step, drawing the webbing between the 8 original lines. On the shortest line work out even spacing from the centre dot to draw 5 dots onto the line. For example, if your shortest line is 6 cm long, make a spacing of 1cm between the dots you will draw onto this line. Then use the same measurement on the remaining 7 lines, then connect the dots to create the webbing. That's the drawing done. You do not have to do the next step, but if you follow this, your hand stitching will be much easier. Take a needle and pierce through each dot you drew on the card. Thus, when you are actually stitching the web, you can clearly see the points for your needle on the other side of the card, which is the actual side where you are going to stitch the spider web onto. Now it's time to do the actual stitching. In the picture above you can see the opposite side of the card you drew the picture of the web on. That's the side with the final stitched picture. Start with the 8 original lines returning to the middle dot of the card. And at last, stitch on the webbing. You will need to use a back stitch on this and will be going back and forth to be able to connect each dot as on the picture above. The other side of the card paper (the one with the originally drawn picture of the web) will look quite a mess and you will use quite a lot of black thread on this. My guess is, I used about 2.5m of stranded cotton thread. A little note. When stitching the web onto the card, do not tighten your stitches too much or you might end up tearing the paper. In my next posting I will show you how to draw a creepy spider and how to cut the black borders to achieve the uneven edge as on my card.